At the beginning of the 19th century, the Jewish community of Vienna was granted permission to build the synagogue under the condition that the building would not be seen from the street. In the years 1824-26 a monumental and splendid synagogue was built in Seitenstettengasse in a Neo-Classical style designed by the architect J. Kornhausel. For the consecration ceremony, held on 9th April , 1826, cantor Solomon Sulzer performed a musical arrangement for Psalms 92 written by the composer Franz Schubert. The synagogue building was considered at the time as one of the city’s most innovative structures and it served as a model for other synagogue buildings in western Europe. It became the first official Ashkenazi communal synagogue. The prayers were conducted according to the Reform liturgy. Two five-storey elongated apartment buildings facing the street concealed the synagogue from view. The synagogue building was built as an oval structure, with a dome in the Mannerist style and topped by an umbrella dome. The inscription on the entrance was (in Hebrew): “Enter into his gates with thanks-giving and into his courts with praise” (Psalms, Chap. 100, V. 4). Around the oval main prayer hall were twelve Ionic columns supporting a two-tiered women’s gallery with partitions. The ceiling was painted sky-blue with golden stars. 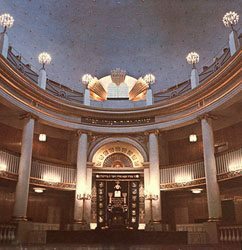 The Bimah was on the east side of the hall and opposite it, stood the double-level Holy Ark, a splendid architectural structure in the Baroque style. On top are the Tablets of the Law within a golden sunburst. The synagogue was renovated in 1895 and again in 1904 by the Jewish architect W. Stiassny. The interior was slightly damaged during the Kristallnacht (9-10 November 1938). After the war, the “Stadttempel” was the only synagogue in Vienna that had not been destroyed during Kristallnacht. It was repaired in 1945. In 1946 a 120th anniversary public prayer was held in it, in the presence of cabinet ministers, to commemorate the re-dedication of the synagogue. In August 1949 the coffins of Theodor Herzl and his parents were displayed at the synagogue, prior to their transfer for burial in Israel. In 1963 the “Stadttempel” was renovated once again by Prof. Otto Niedermoser. It has been declared a historic site and it still functions today as the central synagogue of the Jewish Community, where prayer services are accompanied by the Synagogue Choir.